The Tour De France is a massive bike race. Running from Saturday July 4th to Sunday July 26th , the race is made up of 21-stages and will cover a total distance of 3,360 kilometers. It is estimated that the average Tour De France rider, on an average day, would burn 6,071 calories[i]. This calorie expenditure is equal to about 12-Big Macs, each day. Riders must compete over varied terrains and in all-types of conditions – rain, heat, wind etc. 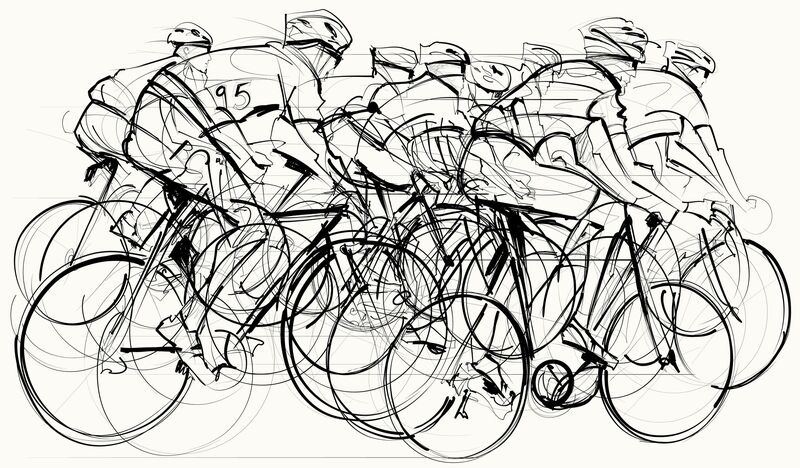 It is estimated that they pedal about 486,000 strokes over the course of the race. While individual riders compete in the race based on time, there are 9-members in a team that support the lead rider. It is incredible to watch these groups flying down the road in tight formations, each member taking turns leading the way and breaking the wind for the pack that is following. Much like how birds migrate with the help of others the same is true for the road racers. The French expression Joy De Vivre refers to the joy of living – living carefree and ebullient. The spectators that line the race route seem to exude joy. Of course this is TV so it may be part of the allure but the crowds do seem to be really enjoying themselves. During commercial breaks the TV will often show scenes of the many villages that the race passes. Again everyone seems happy. The Tour De France is a grueling race, yet each day someone is celebrated with an awards ceremony. The leader after each stage gets to wear the coveted “yellow jersey” the following day and is rewarded for the day. So to sum up – we are amazing machines, who perform better in groups and we should celebrate each day! Nearly 30-years ago, Bobby McFerrin released his hit song Don’t Worry Be Happy. This song came out following the Black Monday[i] crash October 19, 1987, in which the US stock market lost almost 23% of its value in one day – closing at 1,738.74 The song was a needed counterpoint to anxious thoughts about the economy and a lingering cold-war with Russia. Today we Americans are still worrying about the economy among other things. The good news is that it appears as though our economic worries are improving, considering that in 2014, 59% of the respondents were worried about the economy. Still over 50% of us are worried about financial matters. Our tendency to worry seems to be hardwired into our brains. Negative news has more importance to our brain and this negativity bias has served us well in our evolution. For example our negativity bias allows us to view an approaching tiger with more weight than say smelling the flowers as the big cat prepares to eat us. But this bias may not serve us best in today’s world. For if we are not careful to re-center ourselves we may become caught in a cycle of worry and anxiety. Before recorded songs, spiritual sages offered wisdom on the futility of worrying. Regardless of whether something can be fixed or not, there is no need to worry. Therefore I tell you, do not worry about your life, what you will eat or drink; or about your body, what you will wear. Is not life more than food, and the body more than clothes?26 Look at the birds of the air; they do not sow or reap or store away in barns, and yet your heavenly Father feeds them. Are you not much more valuable than they? 27 Can any one of you by worrying add a single hour to your life[? It is incredibly liberating to trust in God and allow things to unfold. Do your best and let God do the rest. I’ll admit it was hard for me to get to that point though. My worry and anxiety seemed to have peaked about 10-years ago after which I hit rock bottom. The expression “Let Go, Let God” eventually became my mantra and helped me through a rather dark period in my life. During this time, I had become a nervous wreck. I had to change jobs as part of a corporate re-structuring, I had major medical bills to contend with, and my marriage was falling apart – ultimately setting me up for support payments and losing ½ of my wealth. Change is a part of life and can be quite volatile. While we can’t control external events we can take steps to manage how we respond to them. Tomorrow will have its own things to deal with. So let’s focus on what we can do now, letting go, and letting God take care of the rest. Since money has been the source of concern for so many, myself included let’s now compare the stock market today to back them. As of July 7, 2015 the US market closed to end at 17,759.01. A 921% increase from the Black Monday of 1987. Daily volatility is part of long-term appreciation. Meanwhile life gives us compounded opportunities if we open ourselves. Worry and anxiety only distract us – wasting energy that could be used in solving problems or creating new art. [i] Black Monday: The Stock Market Crash of 1987 – A Detailed Essay on an Important Event in the History of the Federal Reserve.” Black Monday: The Stock Market Crash of 1987 – A Detailed Essay on an Important Event in the History of the Federal Reserve. N.p., n.d. Web. 08 July 2015. [ii] “In U.S., Worries About Terrorism, Race Relations Up Sharply.” Gallup.com. N.p., n.d. Web. 10 July 2015.